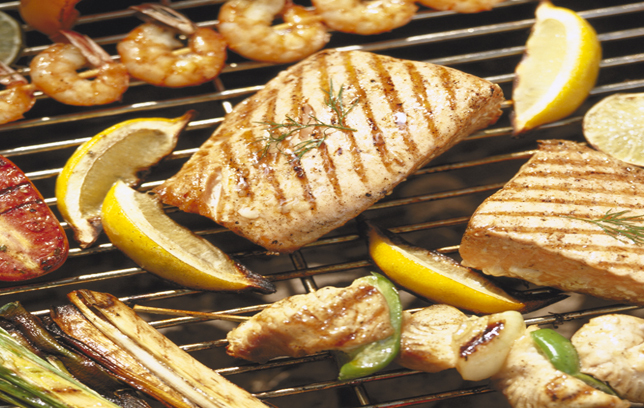 The lemony barbecue dish to satisfy all taste buds. 1. In a shallow dish, mix ground black pepper, lemon zest, and ¼ teaspoon of sea salt. 2. Brush the salmon filets with a little olive oil, and press (skin side down) in the lemon-pepper mixture. Set aside. 3. Boil the washed potatoes over high heat for about 20 minutes or until done. Drain and set aside. 4. Mix extra virgin olive oil, Â½ teaspoon of sea salt, chopped basil and lemon juice in a small bowl. Use a whisk to quickly blend, and set aside. 5. Barbecue each salmon filet (skin side down first) for about five minutes before gently turning until it reaches desired doneness.